Chief Election Commissioner Sunil Arora announces the schedule for Lok Sabha elections in Delhi on March 10, 2019. Lok Sabha elections 2019 will be held in seven phases from April 11 to May 19, the Election Commission of India announced on Sunday, setting up a contest between Prime Minister Narendra Modi, who is seeking a second term, and the Opposition parties trying to stitch up a coalition against his Bharatiya Janata Party (BJP). 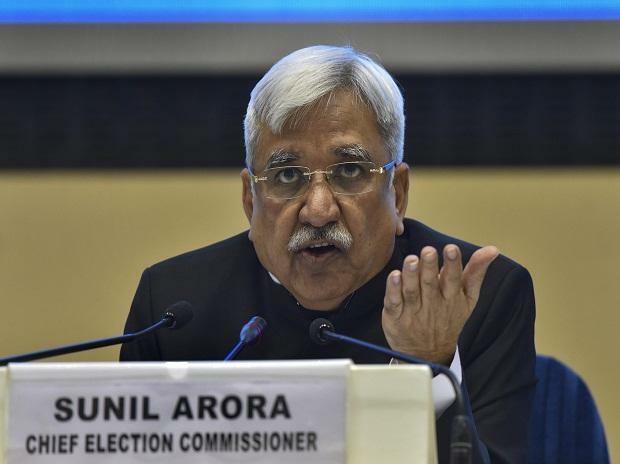 Votes cast in the seven phases—on April 11, 18, 23 and 29 and May 6, 12 and 19—will be counted on May 23, said Chief Election Commissioner Sunil Arora. Voting in Uttar Pradesh, Bihar and West Bengal will be spread across the seven-phase election. Elections for the Assemblies of Andhra Pradesh, Sikkim, Arunachal Pradesh and Odisha will be held simultaneously along with Lok Sabha polls. Jammu and Kashmir will vote for the Lok Sabha in five phases, but there will be no Assembly elections in the militancy-affected state for now, according to Arora. Arora said an election commission team had visited Jammu and Kashmir, where the assembly was dissolved last year, to speak to stakeholders and has decided to appoint three special observers to monitor polling there. Opinion polls show Modi's BIP, which secured the biggest electoral victory in three decades in 2014, might be the single largest party but fall short of a majority, Bloomberg News reported. Modi is said to have lately faced some slide in popularity over rising concerns about lack of job creation and rural distress. "The festival of democracy, elections, are here. I urge my fellow Indians to enrich the 2019 Lok Sabha elections with their active participation," said Modi on Twitter. In the run-up to the elections, the Congress, the country's main Opposition party, has pledged a one-time farm loan write-off, and minimum income guarantee to the poor, and blamed the Modi government for alleged corruption in the Rafale fighter plane deal. "The bugle is blown and now it is the turn of the public. There is adequate preparation for fighting the lies. We will defeat the 'liars' in this government, we are prepared and victory will be ours," the Congress said in Hindi on Twitter.